Identification: This is an orange-red dorid with red gills frosted in white. There are three crater-like depressions on the notum. The rhinophores and gills are flanked by irregular patches of white pigment and there are usually smaller patches midway between them. The notum is covered by a network of tall, sharply delineated ridges with papillae confined to their junctions. The white pigment is dense and usually crosses the ridges and the bottoms of the pits between the ridges are reticulated with lighter pigment. It may be distinguished from Aldisa pikokai by its sharply delineated ridges, its denser white pigment and the presence of reticulated pigment in the pits between the ridges. It may be distinguished from Aldisa sp. #1 by the presence of three crater-like depressions on its mid-notum (in contrast to two in the latter species). Taxonomic notes: The photo labeled Sclerodoris sp. in Kay, 1979 (on p. 456) is actually of this species, instead. It is also listed as Aldisa sp. in Bertsch and Johnson, 1981 (top photo). 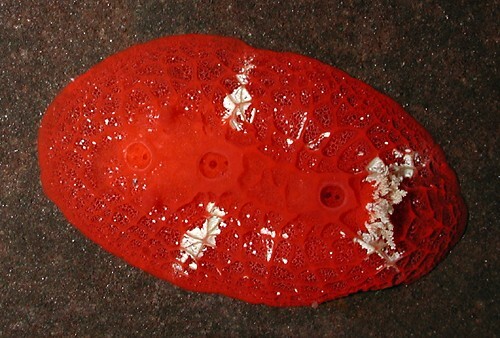 It's referred to as the "pitted nudibranch" in Hoover, 1998 & 2006 (under the name Aldisa pikokai). It's listed on many other sites as Aldisa pikokai and was probably lumped with that species in the original description. It's also possible that examination of the holotype of A. pikokai will ultimately result in assigning the name to this form, instead. It may have been first reported from Hawaii in Kay & Young, 1969 (as Halgerda rubra). Photo: CP: 24 mm: Kapalua Bay, Maui; April 24, 2008. Note 1: Both Aldisa sp. #2 and Aldisa pikokai probably represent widespread Indo-Pacific lineages that tend to mimic each other in any particular region. Conceivably, both may be composed of multiple allopatric species. The populations that occur in Kwajalein and Moorea appear very similar to the Hawaiian animals but determining their precise relationships will require further work.